We hope the following pages will help you to understand what we think modern photo restoration is all about and entertain you in the process. We understand that photo restoration and digital scanning is a very confusing business so please don't hesitate to give a call, or email to discuss. We love to talk about history and the history of photography and how to restore and transform your picture to its original impact and integrity. Our goal is to bring joy into our client's lives by providing quality products and services done with the skill and sensitivity of professional photographers. 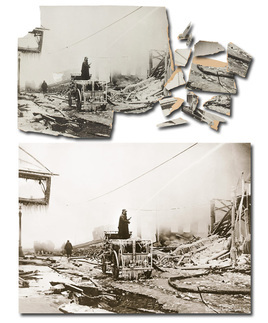 Combining our knowledge of historical photography and techniques with the latest digital technology ensures scanning, restoration and custom printing results unsurpassed. We love to work with people of all ages and experiences, helping them feel comfortable and confident throughout the process. In fact, some of our clients don't own computers! So...what's in YOUR old shoebox? 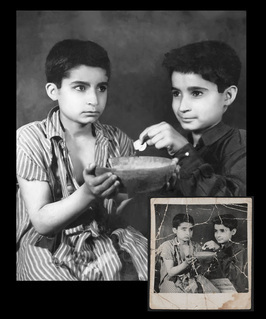 Revisit your fondest memories...restore or recreate the cherished photos from your past today! This is by far one of the best gifts I will ever give someone. Thank you for helping me make it happen, Stephen"